Ghost Chili Magic Plant ( bhut jolokia pepper ). So you think you can handle the heat from the ghost chili pepper? 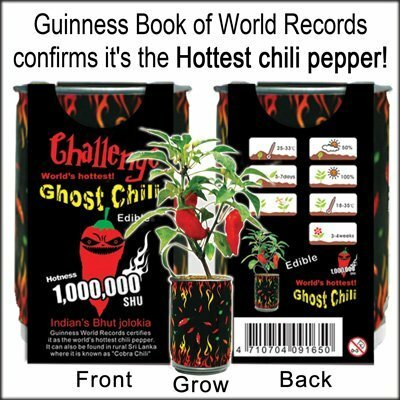 Very few can stand the intensity of the hottest pepper in the world as verified by the Guiness Book Of World Records. Grow your own Ghost Pepper from a seed and find out. 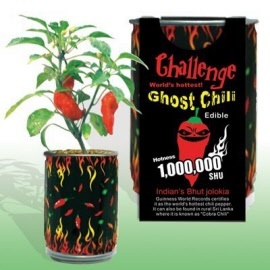 Buy your Bhut Jolokia today limited stock. Each is ready for you to grow as the Bhut Jolokia seeds areare already preplanted in a special soil medium included in the can. Now the easy part is to just pop the lid off and follow the included directions providing water and light and you will be growing the hottest pepper in the world. Have any friends who would like to tempt their tastebuds with over 1 million Scoville units of pure hotness grown right inside the can. You can even transfer the plant once it has outgrown its home. 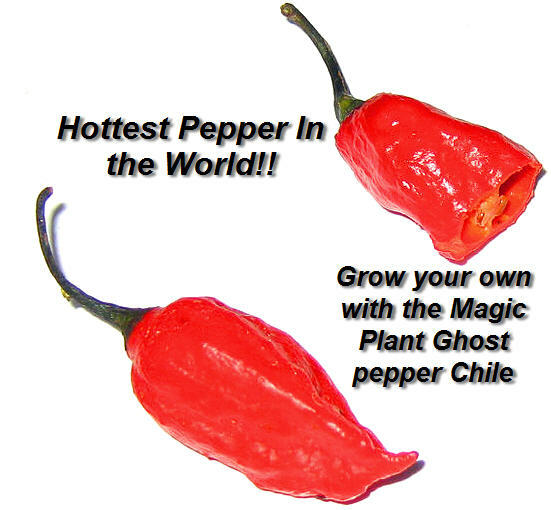 A beautiful red pepper will sprout soon in a variety of sizes Make sure to follow the directions of the Magic Plant Ghost Chili pepper for proper tips and reccomendations on how to grow it. Ideal ranges for growing this plant is 77-95 F (25-35°C). These guys normally grow in 10-15 days. Keep in full sunlight.